The Oracle Database has some useful debugging and diagnostics features. One such utility called the Automatic Diagnostics Repository Command Interpreter or ADRCI, enables database and system administrators to view and analyze information including trace and log files. In addition to the usual ADR commands, you can also issue DML-like statements. These statements are limited to the diagnostics information found in the ADR. Let's take a look at how to use ADRCI to issue DML. Please note: DML statement issued via ADRCI don't require a termination character such as the semicolon. Also, the statements have to be on a single line. 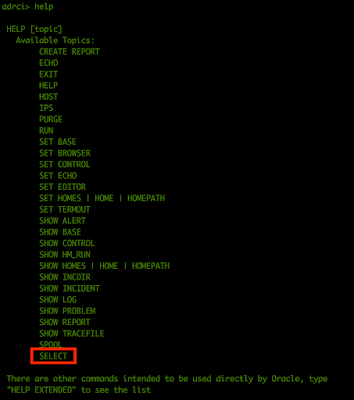 To get a list of the commands, use the help keyword in ADRCI. You may notice that only the SELECT statement is shown by default. To see the list of additional commands, type help extended. First, go to the Oracle Container Cloud Service console and launch a new service. In this example, I created a service with three containers. One manager and two worker nodes. Choose an appropriate "shape" for your compute instances. The Delphix Data Virtualization Engine allows DBAs to spend less time cloning and refreshing databases and focus on other import tasks - like golf or your favorite activity. In full disclosure, I tried golf once and was 'turrible' at it. In all seriousness, having the ability to spin up a virtual database (VDB) in a matter of minutes shaves hours or days off of manual, mundane and error prone work. This makes customers (developers, analysts) happy too. Not only can you quickly and easily create full read/write copies of their production data, they also get the time machine-like ability to go backwards and forwards with their data, which opens up a world of possibilities. IOUG Collaborate 2017 will be held from April 2 - 6 2017 in Las Vegas Nevada. This will be my fifth year speaking at Collaborate, and I will have two separate sessions about data virtualization. One will be a pre-conference Hands-On lab with Kellyn Pot'Vin-Gorman, and the other will be talking about Cloud migration. I will also be doing booth duty for Delphix. If you are around please stop by and say hello. See session details below. For more Data Virtualization related activities see Kellyn's blog post here. As database and storage administrators and engineers, it is important to understand the effect that storage has on database performance. It is important to understand that databases are an extension of your storage and requires a holistic view when designing and managing solutions that use the database. This article gives an overview of the Oracle database storage landscape – past, present and future. It’s not meant as an in-depth technical treatment of the topic but opens the door for more discussion and engagement about database storage. One of the many necessary and frequent tasks that a database administrator performs before creating a database is installing the Oracle database binaries. These binaries form what is known as an Oracle Home (referenced by the ORACLE_HOME environment variable on Linux and UNIX environments). Unfortunately, this is also one of the most mundane and uninteresting tasks a DBA can perform. So like all good DBAs know, the best way to deal with such repetitive task is to automate it. Automating installations of Oracle database binaries enables us to reliably repeat the process to enable faster installation as well as provide identical copies of the software in multiple environments. Fortunately, Oracle allows us to clone the Oracle database binaries from one environment to another. Cloning your Oracle binaries from a source copy with all the necessary patches applied enables us to have gold images which can then be deployed to multiple environments. http://public-yum.oracle.com/beta/repo/OracleLinux/OL6/uek3/x86_64/repodata/repomd.xml: [Errno 14] PYCURL ERROR 22 - "The requested URL returned error: 404 Not Found"